I must say I really love these old gas lamps, do they work, yes they do. They are situated right through the main thoroughfare bisecting the park and in the main areas like the Visitor Centre and Farmleigh. To the best of my knowledge they are still running on gas but obviously they don’t need to be lit manually anymore, at some point in the past they were and I can only guess the amount of staff required to light up the park of an evenin’. I’m guessing the cast iron poles and fittings are all original, some are even dated with the year of manufacture and then others are simply dated with “Phoenix Park”. The lamps all along the main road in the park are all painted black but all the poles on the road up to the Visitor Centre are white, don’t know why they are different colours but I kinda prefer the white ones. My reason is purely selfish, they tend to photograph better with trees in the background. This photo is also the last in my recent series of shots taken of Ashtown Castle in the Visitor Centre. Here’s an interesting fact before I head off, apparently Ashtown Castle is the oldest building in the Phoenix Park. Now, there’s a fact to store in your pub quiz trivia bank. Some technical details about this photo. The photograph was taken using a medium format Bronica camera loaded with Kodak Tri-x 120mm film. The 6cm x 6cm negative was then printed on Ilford Multigrade paper in the darkroom, by myself I should add. All recent photos on the blog have been made by my very own hands in a traditional old style wet darkroom. 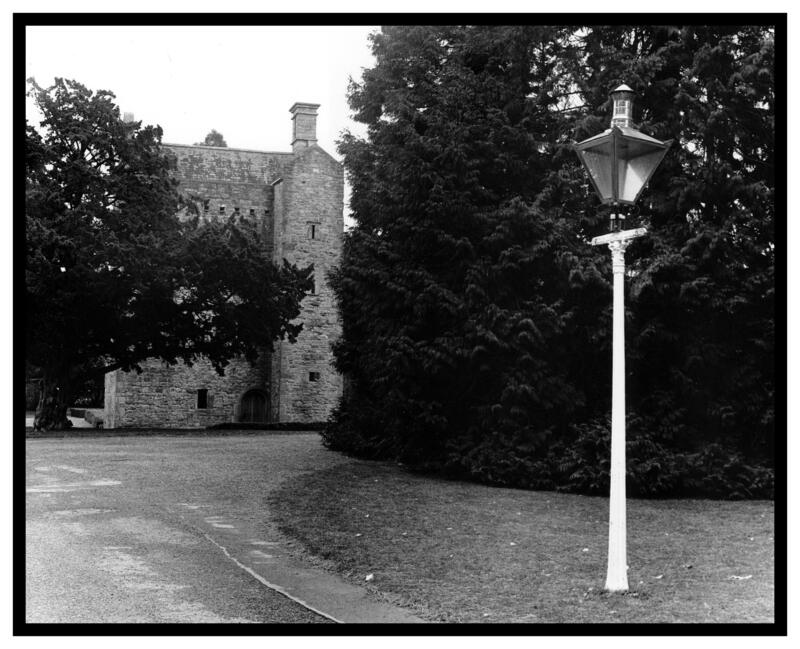 This entry was posted in Black and White Photography, Film Photography, Phoenix Park, Photography and tagged Ashtown Castle, Black and White Photography, Film Photography, gas lamps, Medium Format, Phoenix Park, Photo, Photography, Visitor Centre. Bookmark the permalink.